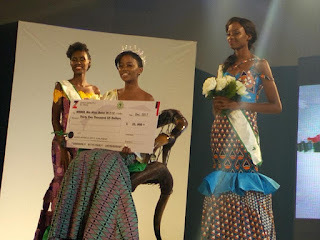 Botswana queen, Gaseangwe Balopi, 21, has emerged the winner of 2017 Miss Africa beauty pageant hosted by the Cross River Government. Balopi won the second edition of the contest after a fourth round of appearances in different attires by 25 contestants. According to NAN, the red carpet event started at round 10.45 pm on Wednesday night at the Calabar International Convention Centre and ended around 3 a.m on Thursday morning. Miss Rwanda, Fiona Naringwa and Miss Luyolo Mngonyama of South Africa were first and second runners-up. Naringwa will take home $10,000 and Mngonyama $5,000. Speaking at the event, Governor Ben Ayade said that the theme of the event ‘Climate Change and Migration’ was chosen to create awareness on the need to protect the environment and caution youths against illegal migration.